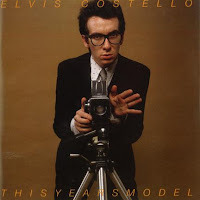 kidslooklikekats: Elvis Costello: "This Year's Model". I own an original first pressing of this record on vinyl, and the rereleased and remastered digipak containing a couple additional tracks. I prefer the vinyl, of course. Another review of a power pop classic from the archives. Would you like to experience the quaint excitement and sheer splendor of discovering that perfect little record you've heard so much about but initially wrote off to overrated pop snobbery? This Year's Model has a magical power etched right into the vinyl it's trapped in that transforms your drab little day-in day-out, monday-through-friday, work/sleep/work/sleep life into a sparkly night-club scene, fronted by an Elvis who traded his blue suede shoes for black frames and a Jaguar. It's an almost immediate transformation, too - Mr. Costello bombards us right off the bat with his confrontational album starter "No Action", followed by a tune we can readily blame new wave on, though absolutely inimitable by its own right in "This Year's Girl". "The Beat" delivers us a slightly more intimate Costello song that suddenly just becomes the post-punk explosion we'll come to expect from him. "Pump It Up", though initially laughably cliche, is quickly redeemed by its great choppy chord structure and heavy beat, separated by some of the most criminally catchy pop ever unleashed upon the world. "Little Triggers" offers an emotionally-drenched doo-wop ballad, while "You Belong To Me" grabs desperately at a last-chance rock anthem possibility, and just misses. Side B is not as much a mess as Side A, and yet, as it always goes, lacks the punch Side A never even intends to begin with. "Hand In Hand" has its catchy little this-and-thats, but is very second-rate next to naturals such as "Pump It Up" and "No Action", and once "Lip Service" begins, we're ready to flip the record back over and cue up one of any of the gems contained on Side A...but handclaps always indicate good things to come, like red sails at night, and lo and behold, we receive "Living In Paradise", a happy-go-lucky twee-romp through life as a jealous boyfriend (how many times have we all been there before?). "Lipstick Vogue" is somewhat hard to classify, at times jazz, punk, surf, and hard pop, and leaves us with the classic hit "Radio, Radio". So you'd better do what you are told...you'd better listen to the radio. Actually, scratch that - not everything Elvis tells you is good advice, even if he is the king, reincarnate.